The Grand Opening celebration of Arbor Terrace Mountainside not only met expectations, it exceeded most people's. 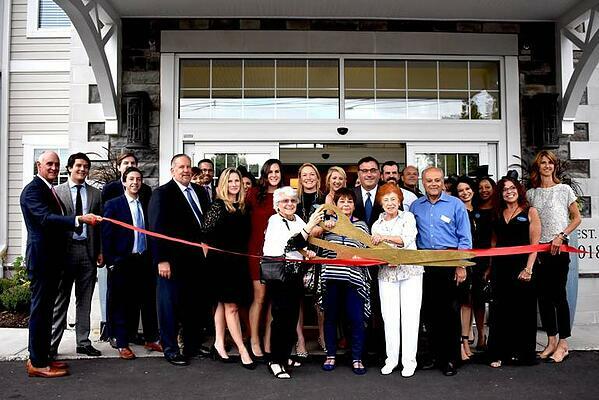 After much anticipation, hundreds of people – including Mayor Paul Mirabelli, members of the Greater Westfield Chamber of Commerce, Arbor Terrace “home office” executives, and others who helped turn Arbor Terrace Mountainside from a dream into a reality – including the bankers, developer, architect and the experts who navigated the plan from its inception through the borough’s planning process, until it was approved – gathered to cut the ceremonious red ribbon at Arbor Terrace Mountainside. Before and after the ribbon cutting and brief speeches, visitors could check out the entire facility – including the courtyard. On the main floor, tables with champagne, wine, beer and soft beverages were strategically placed, while staff members passed hot hors d'oeuvres. Upstairs, on the third floor, one room was devoted to dessert – including three brightly colored chocolate fountains, plus an assortment of dessert squares, as well as hot chocolate, coffee and tea. In the adjacent room, the Tavern, people were invited to sample drinks and enjoy a circus-like performance by an acrobat in gold with fringe, who struck various poses while in a not so large circle about seven feet above the floor. Mayor Mirabelli called Arbor Terrace, “one of the hidden gems” of Mountainside. To hear the residents and the staff speak about Arbor Terrace, he was right. And, they know how to throw a good party. Arbor Terrace Mountainside offers quality, state-of-the-art assisted living and memory care. Arbor Terrace Mountainside gives residents the freedom to do what they want to do, when they want to do it. Independent, assisted living - we don't believe in labels. Instead, we believe in giving seniors the best service, no matter what you need. If you missed the event we'd love to show you around during a tour. Click the button below to schedule your tour today!